Discussion in 'The DIY Tool Shed' started by 24 track, Sep 5, 2018.
noah330, darren7, Deneb and 9 others like this. noah330, Deneb, tintag27 and 4 others like this. noah330, Greggorios, jimbo735 and 3 others like this. noah330, Blue Bill, Deneb and 7 others like this. it sits behind the neck and allows you to loosen the strings and pull them out of the way and fit the strings behind the wings of the tool , my first 2 I made were out of spring steel , but this one was out of a 6"piece of annodized aluminum covered with shrinktubing and a piece of foam weatherstriping to protect the neck of the guitar. noah330, Deneb, 65 Champ Amp and 6 others like this. any body who has attepted toput a jack into an ESTD335 or an acoustic knows the frustration after the first 15 minutes , this device is a 2 foot rod with a 1/4 " plug on the end it allows you to feed it through the plug hole and place the female end of the jack onto the 1/4" plug then fish it back through the body to the hole , and hold it in place while the nut and washer are secured in place, I used this so many times its worth its weight in gold! noah330, eclecticsynergy, Deneb and 5 others like this. noah330, Deneb, tintag27 and 6 others like this. theres always some thing to forget! this is for soldering XLR -M-F 1/4 inch RCA and midi cables . I made this from an old Phone mount that used to stck to the window of your car and some metal plates I had , comes in really handy. noah330, Larry F, stinkey and 5 others like this. Some good tricks in there! I did the post#7 for a while and then I made this device. 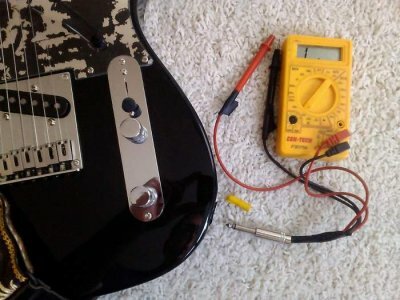 I plug it in when buying a used guitar and I can see what the pickups are or are not. I once had a guy wire the one good pickup to all positions on the switch so playing wouldn't catch it. This did. I've had other problems it's sniffed out in a parking lot making a trade. I just keep it in the car. It was a retired cheap meter. The yellow cap goes on the jack if I really need to use the original probes for voltages but generally I don't. I also made this quick notched leveling beam. Cut a strip of steel banding. Notch with tin-snips. Hammer the snip bent edges flat and take burrs off. Cut a slot in a piece of scrap trim to fit the banding and give it a stiff back. Put sandpaper down on something level and sand the edge of the leveling beam flat. I have a regular guitar leveling beam but needed one for a bass setup and this did the trick. I subscribed to see what other ideas get posted. Thanks! jimbo735 and 24 track like this. Awesome goodies in there. Thanks both of you. I had a similar device to the one in the 4th posting. It detected continuity, power (low voltage dc) and a signal to test speaker lines and speakers. We called it an idiot box in the shop I used to work in. I put a touch switch on a timer so you could grab it and use it without turning it on and forgetting to turn it off. 9 volt battery. Lasted forever. thanks for the replies , I love to see creative people show how they approach common problems ,EXCELLENT! Also great cable organizer. 100 for cheap. - 'endoscopic' USB lipstick camera (< $10 on ebay) .. works with PC or phone / tablet .. attached to other gooseneck. Easier than mirror (but I have one of those on rod too). Geez. 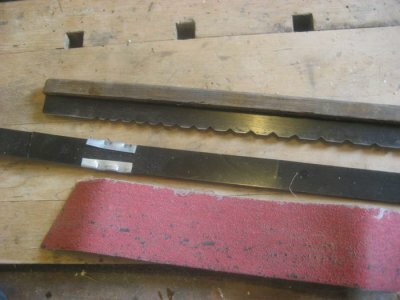 Great thread and excellent DIY tools for our interest/profession/hobby. I nominate this thread for a stickie. Gabrielle84, awasson and 24 track like this. I know that this may not seem quite the same, but this is my wiring harness that runs the router and wi-fi from my off the grid 12VDC ... so that I can get guitar/pedal/amp help from my TDPRI friends. Deneb, tintag27, stinkey and 1 other person like this. I use those for cable ties they are fantastic and you can never have too many. great sugestion! tintag27, stinkey, jimbo735 and 2 others like this. nickhofen and jimbo735 like this.